Anyways, good morning! 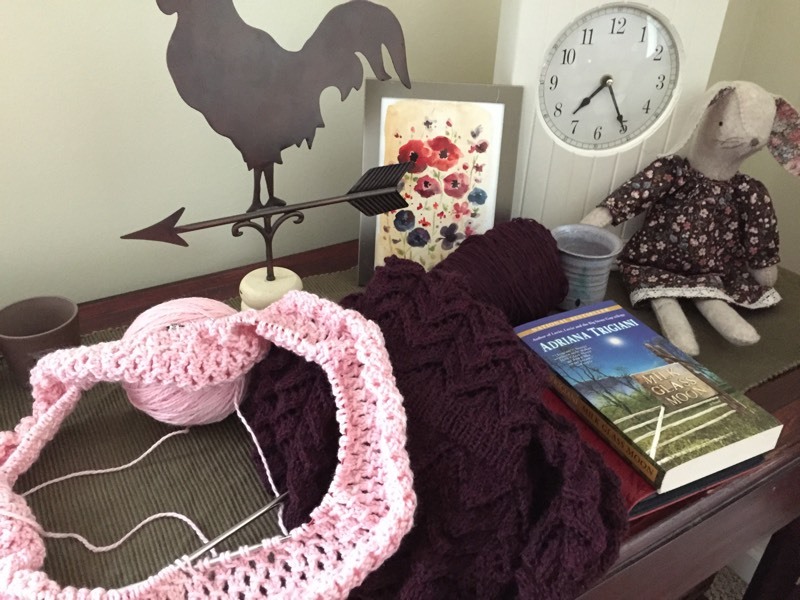 My knitting is down to two projects (I'm not counting that scrap sock blanket...it is idle right now). I'm knitting the infinity cowl and enjoying the process thoroughly. This is what I was working on while riding in the car to and from Boston. As you can see, I didn't make much progress, I was too busy looking out the window or talking. My other project is the hitofude cardigan. I am on the skirt increasing and I believe in a few weeks I'll have another sweater. I do love this pattern and if you are adventurous you should try it. My reading continues to be Jane Austen's Persuasion. I wasn't sure if I read this novel or not as a teen but I'm glad to report that I did not read this one. I'm enjoying the story and the characters. I tend to like the dramatic ones :) I have started the third book in the stone gap series Milk Glass Moon. That cardigan is just going to be divine! And I so love the colour. I have only read the first two books - didn't know there was a third. Have to check at the library immediately! I only have two projects too, beside the blanket that will probably be around forever! I really want to knit a hitofude cardigan after seeing yours, it's beautiful. Fingers crossed that your computer is just tired this morning and not sick. The Hitofude Cardigan looks so awesome, but I guess I really am not adventurous enough for it ;-) I adore the colour you are knitting it in, such a great shade of purple!! Have a lovely day Karen!! Both the yarns you are using are a real delight, the colours are stunning. I love the infinity cowl! I just put in my queue. I think it will make some nice Christmas presents. I seem to be in a knitting hiatus and have not worked on my hitofude in weeks. 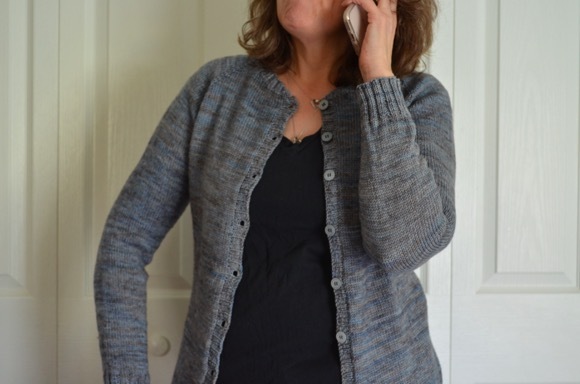 I have knitted the Hitofude Cardigan four -- yes, four times over the last year! My knitting is tight and I found it difficult to swatch this pattern, so the first one came out too small for me...gift to granddaughter. Two other granddaughters saw it and just had to have one too. Finally, number four was for me! Waiting for cooler weather to wear it! I thought the pattern was really easy to follow -- step by step is the key. I am curious to hear how your lengthening of the sleeves worked out. I'm hoping I like the longer sleeves, my first one I love and wish the sleeves were longer so you would think I will be happy! I'm anxious to see your Hitofude. Every one I have seen has been a work of art. We will have to meet up on one of your trips to Boston. You are only an hour away! Looks like you got a bit of knitting done on the road. Always enjoy seeing your projects. :) Thanks for sharing. i am going to read that series...I've placed a hold on Big Stone Gap at the library!!! 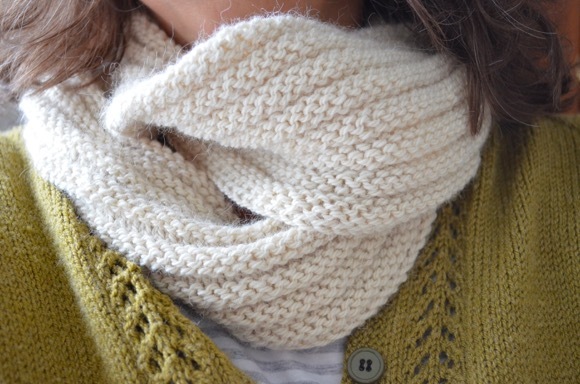 Your knitting projects are always so lovely. I love mesh cowls and that pink is gorgeous. Hitofude calls my name but I haven't worked up the courage yet. I enjoyed the Stone Gap books and need to see if there are any new books in the series. Oh that Hitofude cardigan, can't wait to see it's finished in this colorway! The infinity cowl is coming along nicely too! I cannot wait to see your cardigan finished and I added it to my favourites in Ravelry. I added the cowl as well. :) As for books, I've never read any Jane Austen as much as I love classical lit. Loved Wuthering Heights and Tess of the D'Urbervilles. Perhaps I should add a Jane Austen to my list. I need to revisit Hardy. I was not a fan of him as a teen but maybe I am mature enough now! Your cardigan looks beautiful so far! I absolutely love the color. Glad you're enjoying Persuasion--it is rather dramatic, but certainly one of my favorite romances! As always, your knitting looks lovely. The color in the Hitofude is so rich. It will be perfect for Fall. I am reading Agnes Grey by Anne Bronte and listening to a Fannie Flagg's "The All-Girl Filling Station's Last Reunion." Nothing like a little contrast in novels. I love fannie flagg anything! I haven't read Persuasion, maybe I should! Great colors on your knitting projects. Love those two colors together! I am about to start The Bartender's Tale by Ivan Doig for book club. I'm working on several project, one of which is nearly done. love that pink!!! Jane Austen is such a great read! very fun! Your knitting is always beautiful, Karen. I especially like the shade of pink in the cowl. I have not but now I will look for it! I can't wait to see your cardigan Karen. I am thinking I might need to knit myself one :) I always love the colours your pick for your projects. Your cardigan is join to be gorgeous Karen!! Is the pattern easy to follow for you ? I looked at it and for some reason became quite confused. when I read through the pattern it made no sense to me, however if you knit as you go through the directions I think it will make sense.